Back in May I had a great day at the Anti-Ageing Show and was gifted some great products from NuSkin. 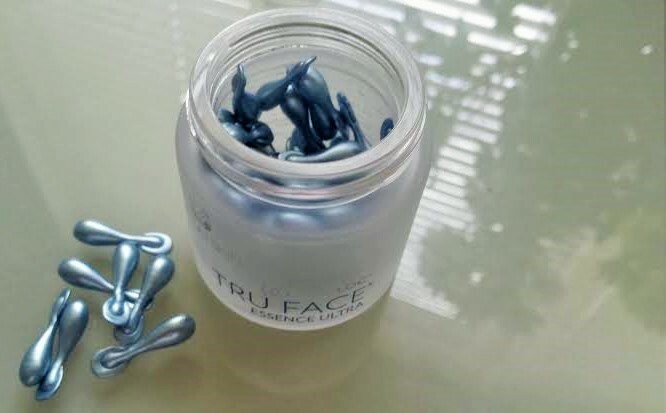 Over the past few weeks I’ve been trying out some of them and it’s time to tell you what I thought of ageLOC Truface Essence Ultra. First the science – ageLOC® was developed by Nu Skin® in collaboration with leading scientists. ageLOC® science is a revolutionary approach that claims to change the way we appear to age. It’s based on the discovery of age-related super markers. Nu Skin®’s exclusive ageLOC® science targets these supermarkers which are the ultimate sources of ageing that can influence how we age. Nu Skin® has been able to identify certain genes that can influence the way we look as we age and incorporates this science into the development of Nu Skin® products. 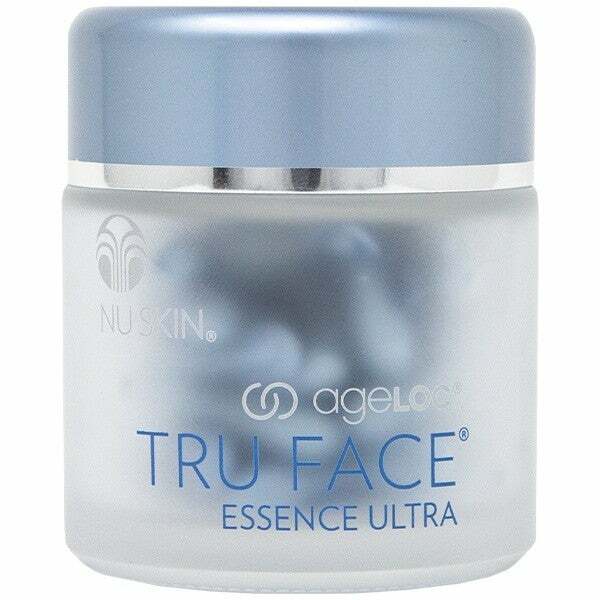 ageLOC Tru Face Essence Ultra is designed to give you more youthful looking skin. It’s formulated with Ethocyn, and is contained in uniquely formed capsules which target the sources of the visible signs of ageing, such as the loss of skin firmness. Presentationally this is a class act, the silvery blue capsules containing their precious cargo are contained in a weighty glass jar. Sadly, I smashed mine on the bathroom floor and had do scoop them into a drawer of my Muji storage. Each capsule contains enough serum to cover your face and down onto your neck. It’s got quite a glisteny look to it – if that’s a word. I used it as a first layer of product directly after cleansing so that it could sink into my skin. I followed up with moisturiser and primer to lock in the “power”. (I’ll report more on other NuSkin products in a future post or two). I’ve lost a few pounds in the last few months and at my age I have to watch that losing plumpness from my face doesn’t result in sagging jowls. I feel that this ageLOC Truface Essence Ultra has helped that cause. Having used it morning and night for a number of weeks my skin feels pretty firm and hydrated. It looks dewy too. Like a said though, this is a class act and it certainly doesn’t come cheap. It’s a hefty £181.50 for 60 capsules here. At the risk of encroaching on another brand’s strap line – I guess the question is – are you worth it? This product was gifted to me for review. The opinions are my own and are not prescribed.